I was born and raised in Florida. After many years of travel, attending plein air paint outs, I discovered that residencies are the best way to explore the natural world I love. Working for an extended period from seven to ten days really enhances my painting experience. I am lucky to have friends and collectors who make it possible to explore the exciting and interesting locations I love to paint. Supporters provide their unoccupied vacation homes or hotel lodging for my residencies throughout the year. I am always delighted to leave an original framed painting for them as my thanks for their generous gift. If you would like to sponsor a residency, I would love to hear from you. 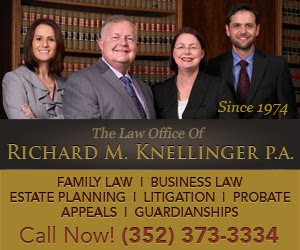 You can receive this blog automatically in your email by submitting it below. 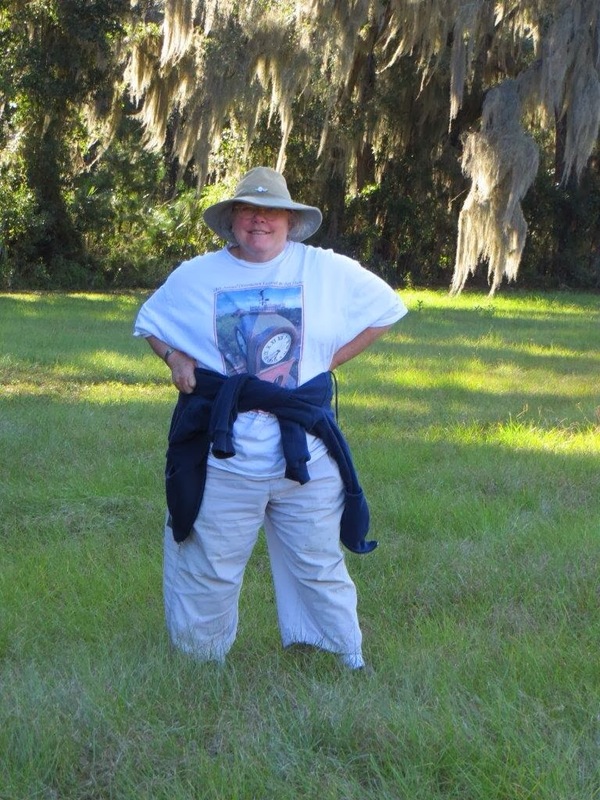 My guest Mary Jane and I had a full day of exploration at Little Talbot Island and Big Talbot and Ft George Islands, all the small and large nooks and crannies. The dune walks and beach boardwalks are especially lovely this year. All of the pink grasses are in full bloom now. I got to spend some time watching th waves roll in on the white sand beach at Little Talbot State Park. I have a great love for the large Red Cedar trees that grow prolifically in the dunes there. We toured the Kingsley Plantation, which is beautiful but sobering with the history of slavery there. The tabby slave houses are all still intact. I learned that Kingsley plantation was a major destination for slave boats coming from Africa. It is such a beautiful place to have produced such horror in our past. 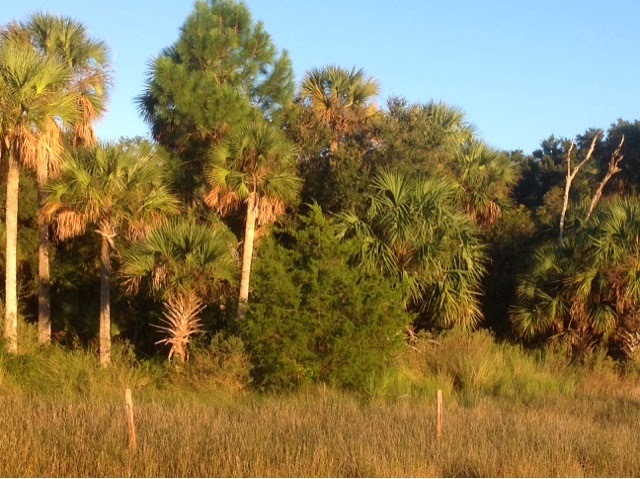 The front yard has tall stately palms with a vast view of the marshes. 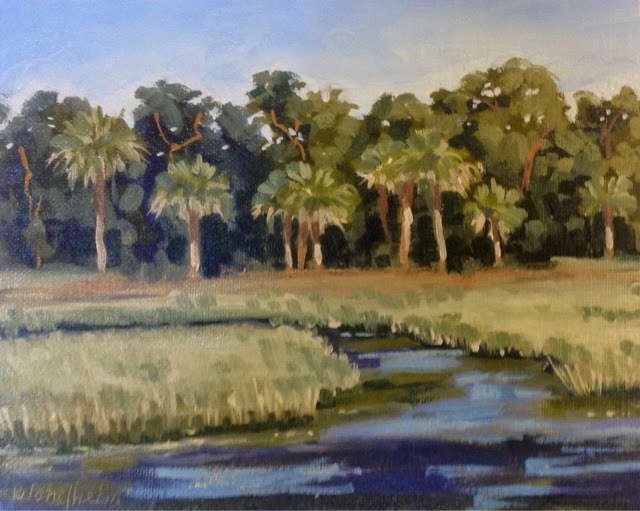 After my lunch of tuna fish on potato chips, I settled in to do the above small painting of a view from the Big Talbot House, provided by my friends at North Florida Land Trust. This house is large and very comfortable, with a lovely view of tall cabbage palms and the distant marsh. There is a fine long dock out on the water with spectacular marsh views. I could paint here forever and not grow tired of it. 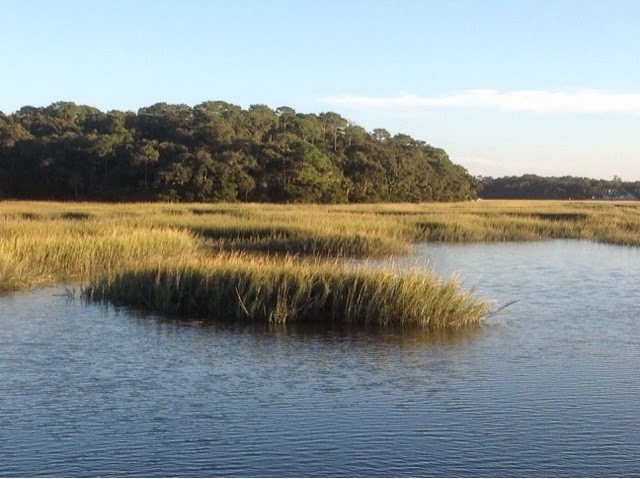 This chain of pristine barrier islands beats the heck out of St Simons further north. This is a truly splendid part of Florida. Tomorrow we are to explore Amelia Island, Ft Clinch, and Fernandina Beach. More from paradise tomorrow. Enjoy my Monday-Friday Painting and Recipe of the Day in your email inbox. You can sponsor this project by donating to my fuel costs or my costs for food in traveling to residencies. 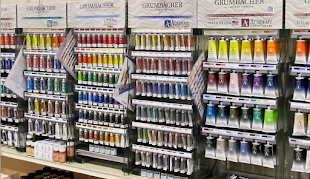 My painting supplies and housing are covered by my residency hosts and my corporate sponsors. These adventures are expensive. Your sponsorship will help me defray the costs of travel. If you would like to assist me please use the paypal link. Thank you for your sponsorship Art Alternatives. Thank you to all of my Corporate, Business, and Non Profit Sponsors. Thank you for sponsoring my workshops, Gamblin. Thank you for your sponsorship French Canvas. 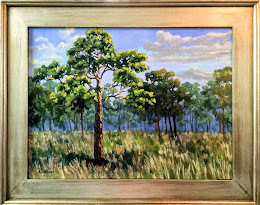 My mission for this project is to explore and paint my favorite natural places while promoting our national, state, and county parks in Florida. I want to create more awareness of these beautiful facilities so the public may enjoy Florida's natural resources. I am a native Floridian. I love to travel and spend time studying the variety and diversity of scenery in our wonderful state. 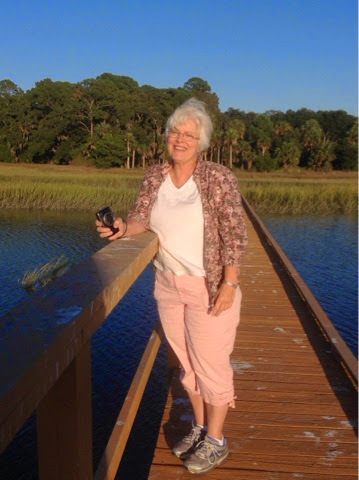 I look forward to the opportunity to discover more of natural Florida and the south, sharing it with others. 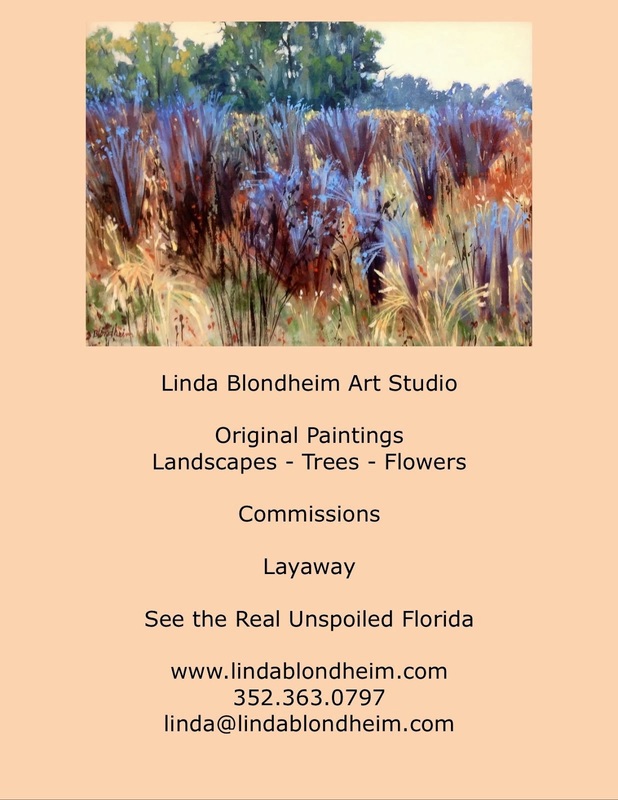 www.lindablondheim.com. Simple theme. Powered by Blogger.